ROM global : pre-register available now. Official Mobile MMORPG [Ragnarok M: Eternal Love] soon available in Global! The battles may have started 16 years ago, but still they rage on! The Kingdom of Rune Midgard has many more stories to tell! Your friends are waiting for you in Prontera to continue the adventures of love and companionship, and to fight for the honor of the kingdom! Are you ready to join them? 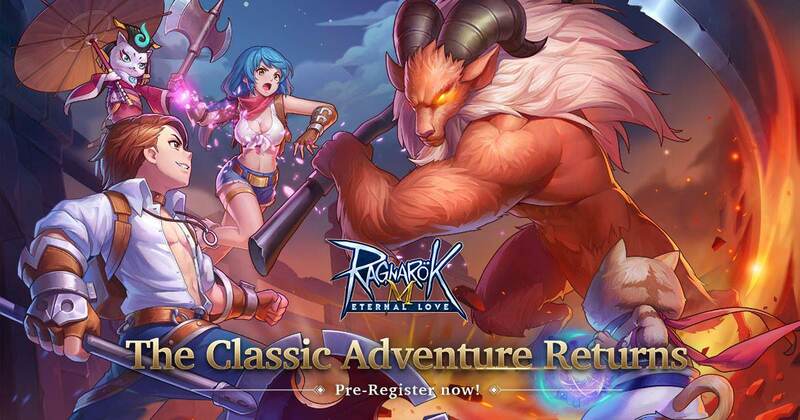 The Official MMORPG ‘Ragnarok M: Eternal Love’ will soon be available in NA, SA, OCE, and South Asia! The adventure continues after 16 years! Ragnarok is back! Let’s join Rune Midgard and fight to protect the Eternal Love in the world of Ragnarok Online! Even they mention as global. The game only be available in North America, South America, Oceania and South Asia. Maybe the other regions will be available in the future (except Europe for obvious reason). Edited by Sigma1, 28 November 2018 - 10:16 PM. Pre-register done. Waiting for the release of the game. Pre-reg doesn't work for Indo...? On point. I've been doing all the quests in all the towns I've been to and not leave until I've helped every citizen in the area, specially the Bard quests. You guys will really enjoy grinding. The game really boring for me who dont like mobile games. Its good for people who like to play afk games. Those who afk lvling in iRO really suitable to play this game. It's not really an afk game. Autoing is just a QoL. You really want to press your screen a millionth times? There are more to it than meet the eyes. Guild wars and PvP won't work with autoing. I am not sure how exactly this topic is derailed into dramatic postings of population drop, the earlier topic was closed for a reason so please do not resume that here. On topic, some other regions are not "yet" included. I assume this is intended, other regions may have their own version in future. Once it is officially released, we will learn better or so I hope. The game not having a Europe server means it'll be wholly reliant on loot boxes for income. Not really encouraging. I might step in to play but I will have at least one year to see how it goes. Most mobile games are AFK games and they're not even close to MMORPG. Although this game has worse loot boxes/Gacha systems than ours(RO1). You should try play it once mates. Their storyline through main quest is quite enjoyable. I reminiscing playing the RPG(not-MMORPG) game again, like I used to play PS1/PS2 console games decades ago. Yeah, Gravity pour all his(ours) resources to this RO:M..
>their gacha are useless. for cosmetics its good but overall. crafting gears are better.so this is not really Pay to win but you need to get premium if you are rush leveling your char. 1. good lore. players are 'forced' to do story quests since it gives good exp and items, so they will also enjoy the lore. 4. Being in guild really reward its members. You want to be stronger? Join a guild. You'll miss the talent system if you dont. 1. After taking higher level of skills, i cant choose to use the lower leveled ones. Edited by fuyukikun, 02 December 2018 - 11:39 PM. good past time indeed. but nothing beats the true RO. waiting for taekwon 3rdjobs. oh about the card drop system on mobile..
sure it is hard to drop card. but with a lvl 50 alts green bag theres an OCA free. you just have to create and delete 2nd or 3rd char..get to lvl 50(1.5 days if fast).. open the green bag..put the oca on shared stash get by 1st character. maybe a chance to get GR or angeling. Before that happens we probably have already discovered that there are life on other planets. Edited by VModCinnamon, 06 December 2018 - 04:13 PM. Mod Edit: Please do not use red font, it is for moderation purposes. How are these threads discussing other non-RO1 game not getting cinnabombed? We don't need want to know if u are / prefer playing ROM or not. Enjoy the compounding char deletion countdown timer for every characters deleted under the same account. Buying undervalued cards and mix it for chance on getting another cards is easier than doing above means, besides earning tons of zeny are much easier in the mobile version. It is still about RO. RO1? It's future. For this one I think it should be fine, considering Warpportal is advertising the game on these forums. If you have adblock enabled, it is possible that you missed the advertisement window Other than that, you can report post/topics and we will look into them.